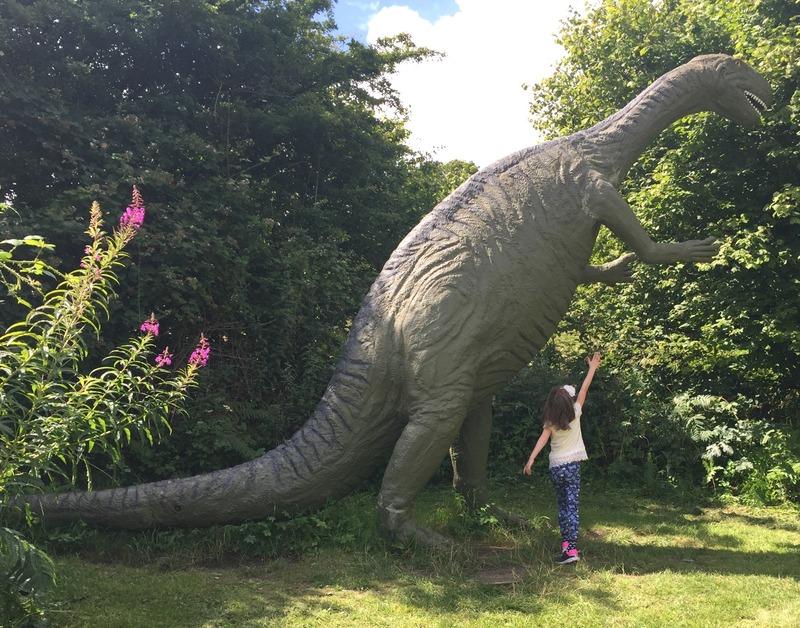 All three of my children love dinosaurs, so The Dinosaur Park in Tenby was a natural choice for us on our recent holiday to Pembrokeshire. 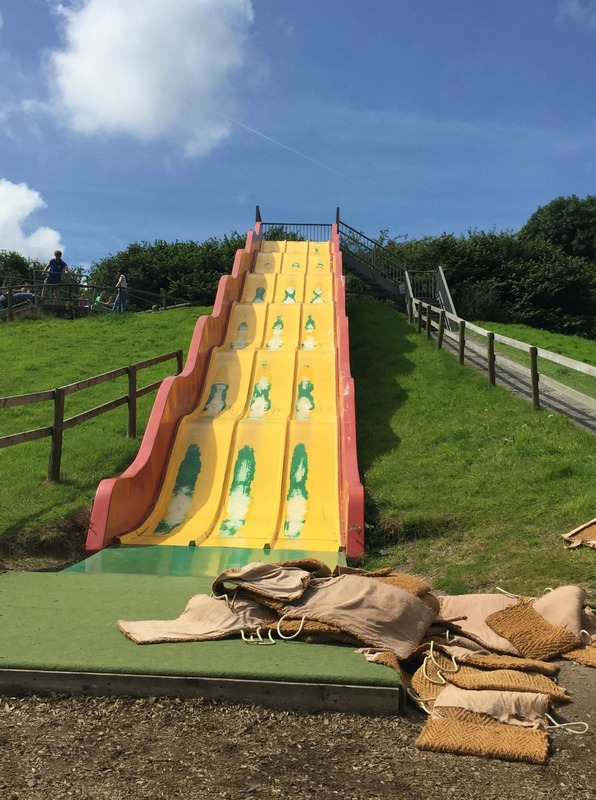 The park was opened in 1994 by husband and wife team Amanda and Simon and, as well as a dinosaur trail through the woods, it’s filled with fun outdoor activities for children, including a tubey ride, motorised tractors and cars, loads of ride-ons, dino-themed golf, and indoor and outdoor playgrounds. We arrived at around 10.30am, left just as it was closing at 5pm and had no problem filling our time there. The dinosaur trail itself took us around 40 minutes. 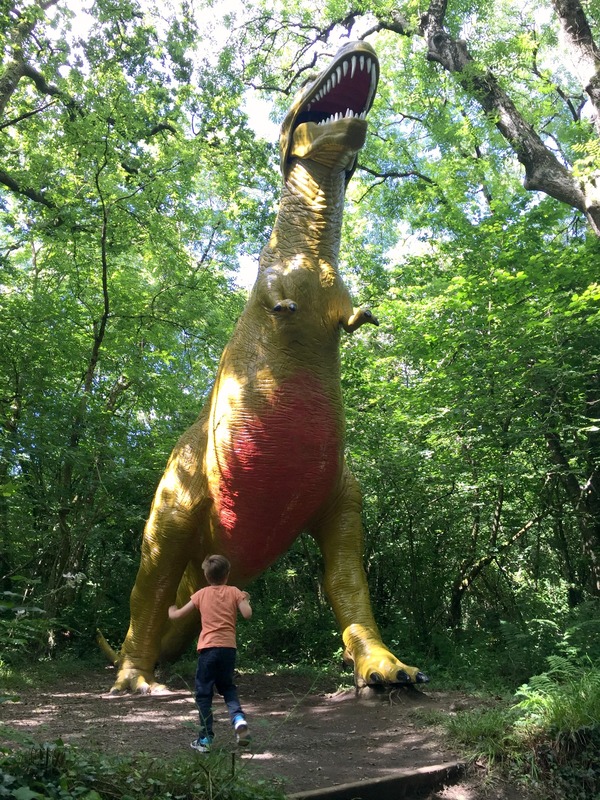 It’s a buggy friendly walk through the woodland, but Toddler Boy I, my 2¼-year-old youngest child, had great fun running around spotting the dinosaurs – and roaring at them too, of course. 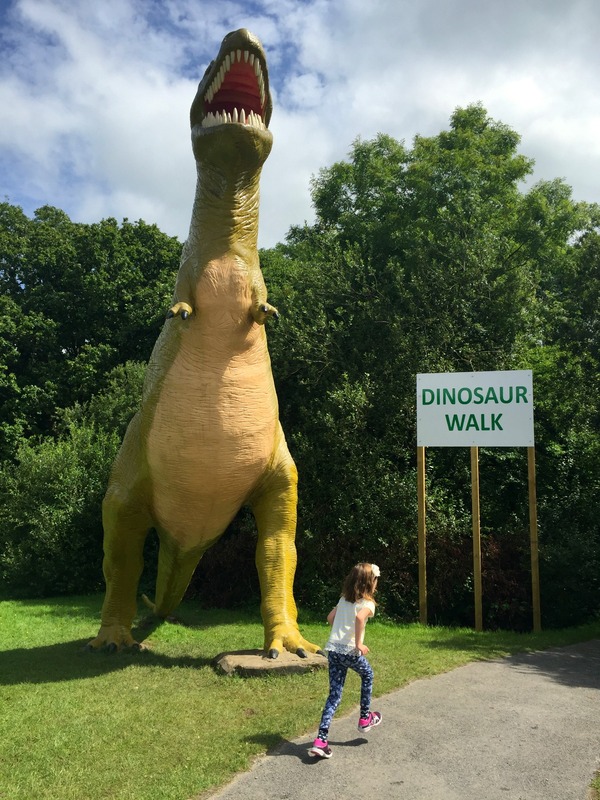 There are around 30 dinosaur replicas on the trail, with some of our favourites including the parent and child triceratops, the huge T-rex and the brachiosaurus. Next to each dinosaur is an information board telling you a bit more about the creature, telling you when they lived, what they ate and a few interesting facts. We also went on the dinosaur safari, which is new for 2016. This is a five-minute journey through the woods on a seven-seater golf buggy-type vehicle. This wood is home to various baby dinosaurs, who are, according to our tour guide, just getting used to people before they move to the main dinosaur trail. My children were thrilled to see that these dinosaurs moved and roared, which was a nice touch although thankfully not too scary! 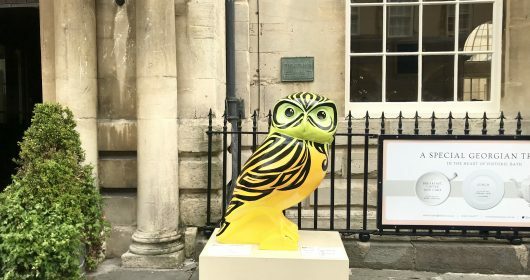 I felt the tour was a little rushed – we did it near the end of the day when no doubt the guide was bored of saying the same things a hundred times, but my children didn’t seem to notice. It would be nice to see a few extra dinosaurs added to the line up too. Although the dinosaur park doesn’t have any of the big showcase rides of other local attractions, one thing we loved was that once you’ve paid your entrance fees, pretty much everything is included in the price. This was great because we spent the rest of the day on the various attractions and didn’t have to worry about costs. Well, apart from a 2p charge to operate the orbiters, safari tractors and moto quads, and a £1 booking fee to ride Ting Ting, the walking dinosaur, and operate the sand diggers. But even that seems pretty reasonable. Despite visiting on a dry day in school holiday peak season, we were so pleased that we didn’t end up stuck in loads of queues. 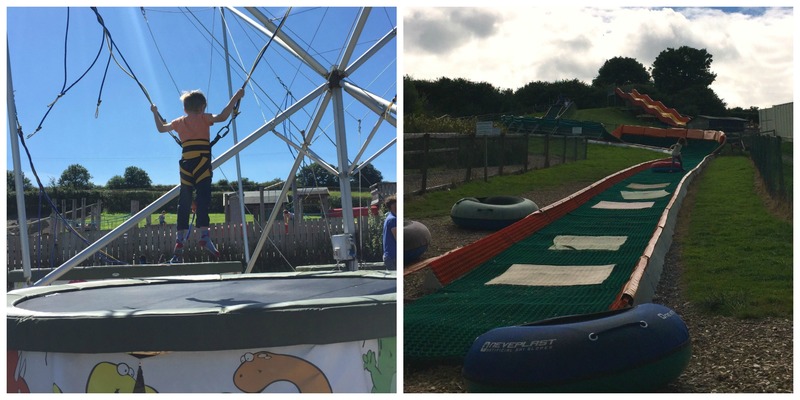 The two busiest attractions when we visited were the water bubbles and super bouncer trampolines, which Little Miss E, my 6½-year-old daughter and Little Man O, now coming up to 5, waited around 20 minutes for – and absolutely loved. 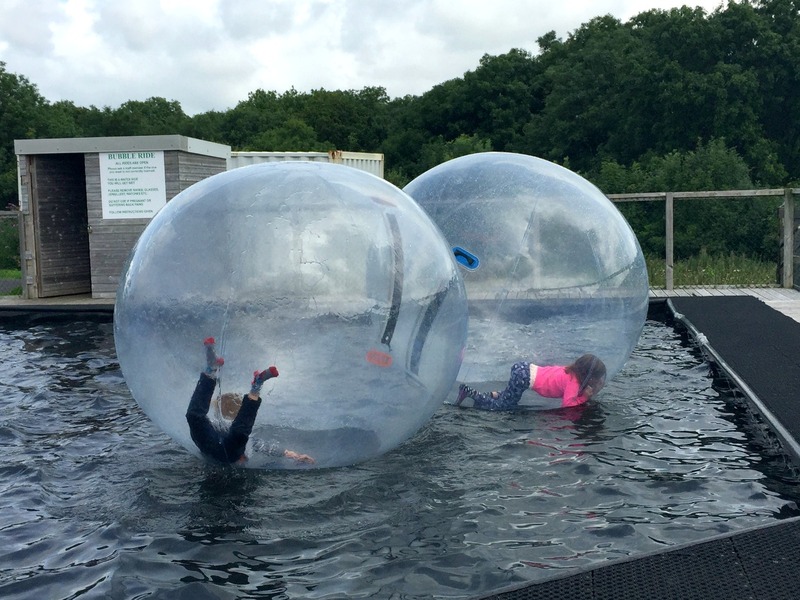 They went on the bubbles three times in fact, and although they could barely stand up, they were laughing their little heads off as they tried to walk across the water. We didn’t have to queue for anything else so my children had fun trying out the child-sized 4×4 off roaders, the discoboats (inflatable motorised boats that spin around in the water), and the dino archery. The tubey slide, where you sit in an inflatable donut and come whizzing down a curved track, was another big hit and they went on that about 10 times in a row. Toddler was a little too young for some of the rides his big brother and sister were going on, but they were more than happy to accompany him on his choices, such as the motorised tractors and mini cars and the various ride ons. 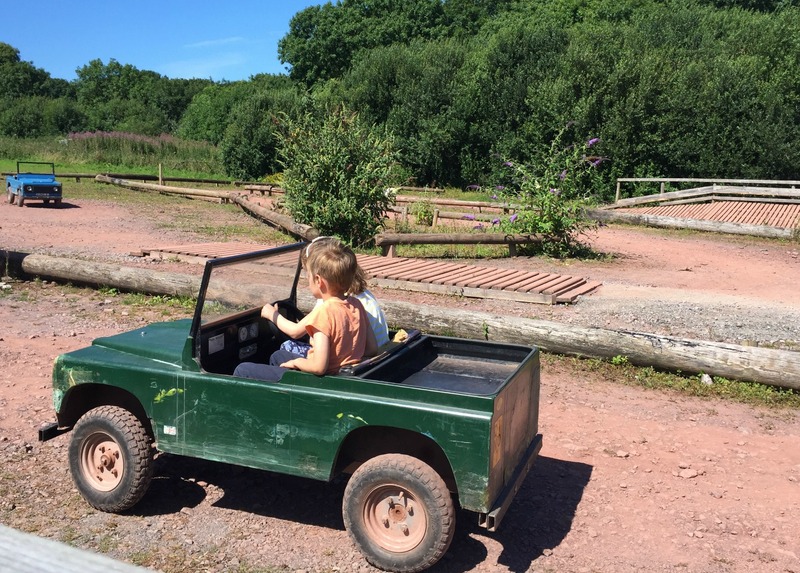 Toddler also loved the outdoor playground and the sand excavation pit, and all three had fun in the indoor play barn, which had separate areas for younger and older children. There’s also a rocky T-Rex 12 hole golf course, which we didn’t play on, but certainly looked fun, and a twice-daily fossil hunt in the amphitheatre, with additional shows scheduled if the weather isn’t great. 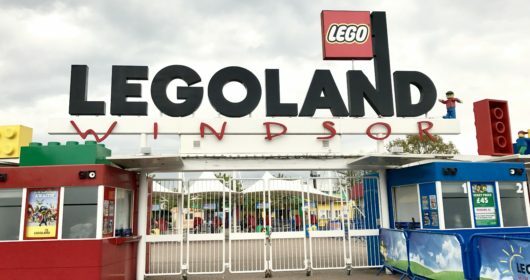 Some of the attractions are weather-dependent, so we were really glad to have visited on a dry day, because I think it might be a bit of a let-down in the rain. My children are the perfect age for the park, which I’d say is best suited for older toddlers to age eight or nine. Younger toddlers of around 18 months and under seemed to struggle with the vehicles, while I think those age 10 and above would probably get a bit bored. We took a picnic and ate it on one of the many picnic tables, but there is a cafe (with a small play area for the under 4s) serving hot and cold meals, and a gift shop with plenty of dino-themed merchandise for sale. Like I mentioned, the park doesn’t have any absolutely amazing showcase rides, and some of the attractions would benefit from being bigger. It could also do with a lick of paint in places and you could feel a little underwhelmed when you arrive. 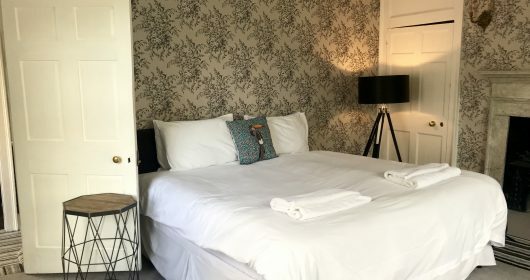 But once you start exploring, you’ll notice all the fun little attractions and the laid back atmosphere. All of that combined really adds up to a great family day out. 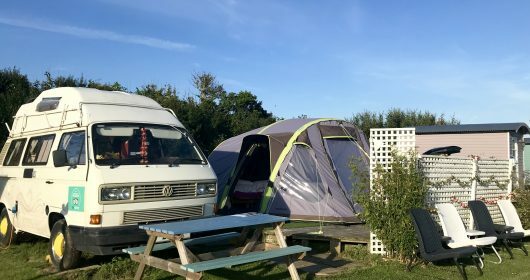 The Dinosaur Park, Great Wedlock, Gumfreston, Tenby, Pembrokeshire, SA70 8RB. 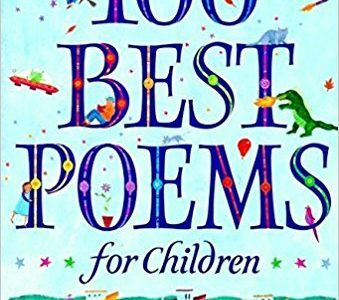 Adults £10.75, children £9.95, under 3s free, OAPs, £9.95. For seasonal opening hours, see the website. You can also follow them on Facebook. 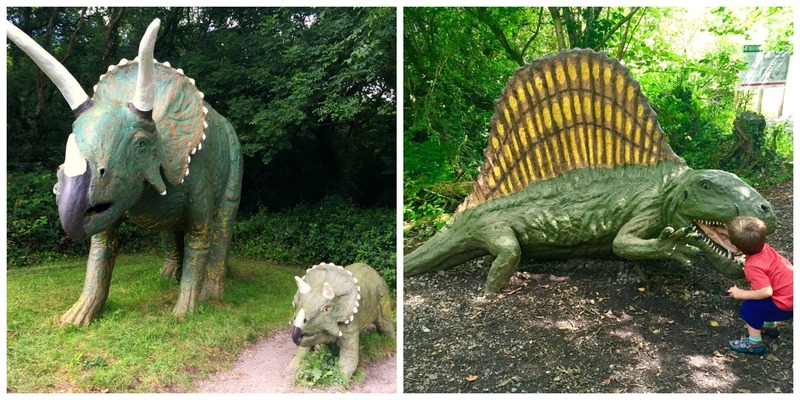 Fancy a trip to The Dinosaur Park Tenby? 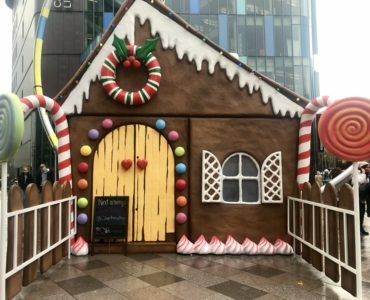 Cardiff Mummy Says has a great giveaway for one lucky winner to win one adult and one child’s ticket for a day at the park. For a chance to win, just answer the following question and leave your answer in the comments section on the Dinosaur Park post on Cardiff Mummy Says Facebook page. 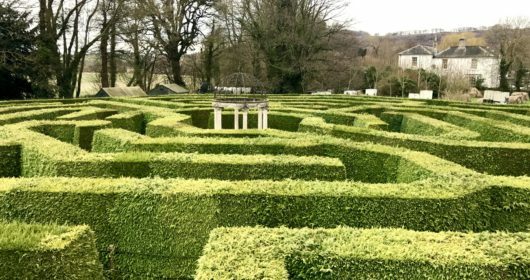 who founded The Dinosaur Park Tenby? 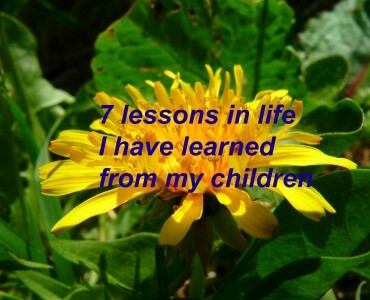 The prize consists of entry to The Dinosaur Park Tenby for one adult and one child. The prize must be used by 29th October 2016, which is the last day of the 2016 season. There is no cash alternative. Entries will be selected at random from entrants providing the correct answer, and the winner will be notified via Facebook. Closing date for entries is Friday 12th August 2016, 11pm. We were given a family ticket to The Dinosaur Park for the purpose of this review. All opinions are my own. 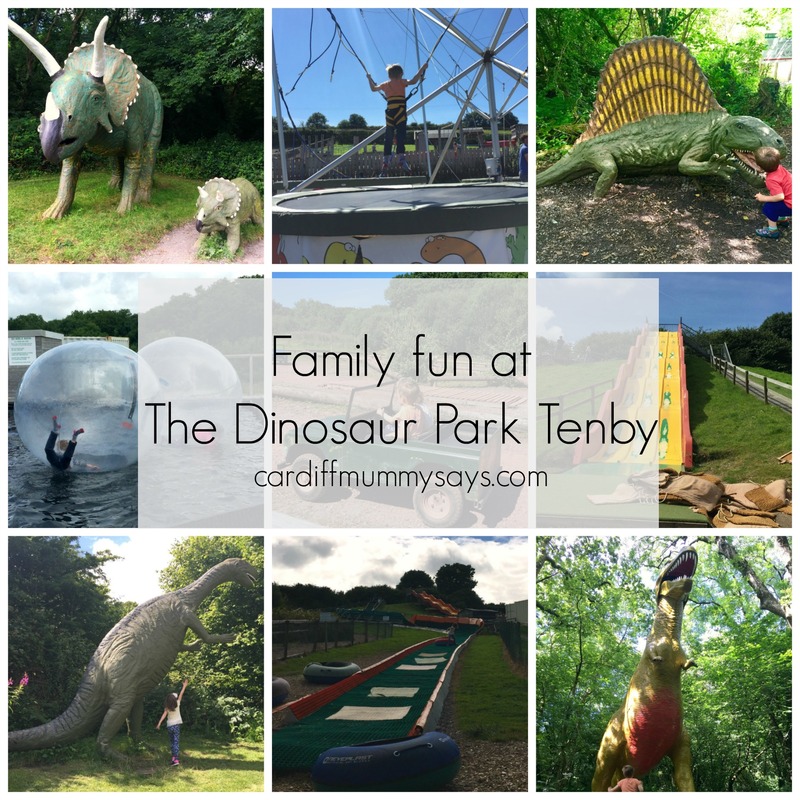 Homepage » Family Travel » UK Family Travel » Family fun at The Dinosaur Park, Tenby – plus win tickets! 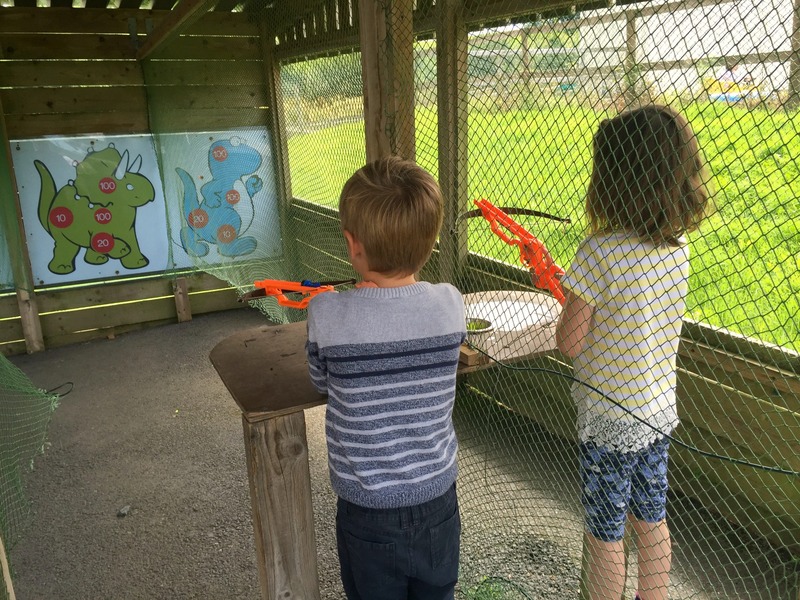 7 Comments to Family fun at The Dinosaur Park, Tenby – plus win tickets! Amanda and Simon! Looks great, would be a fab end to the summer hols! 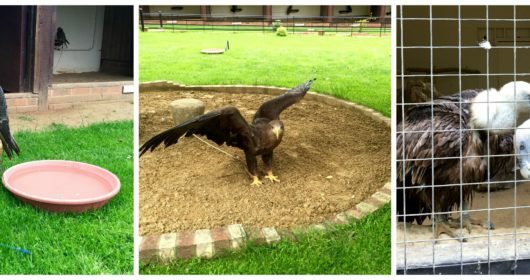 How would you say the park is for someone with special needs …. 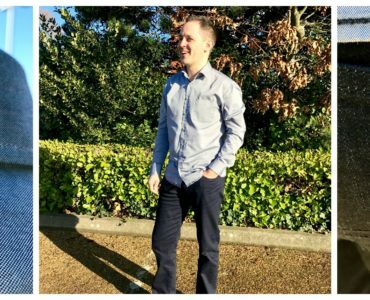 Looks like you had a lovely day there…we’re off to Tenby on Saturday and it’s his birthday Wednesday and looking for somewhere to go…think this is the place as he loves dinosaurs. Amanda and Simon are the founders for the Dinosaur Park. We haven’t visited in years, it would be lovely to go back. Amanda and Simon. My dinosaur obsessed son and daughter would love this. Great prize!